The starter is a living entity; it eats and grows. Sourdough baking has been around a long time. The Egyptians were using the method some 6000 years ago. Until the middle of the 1800s, it was the only way to make yeast bread. 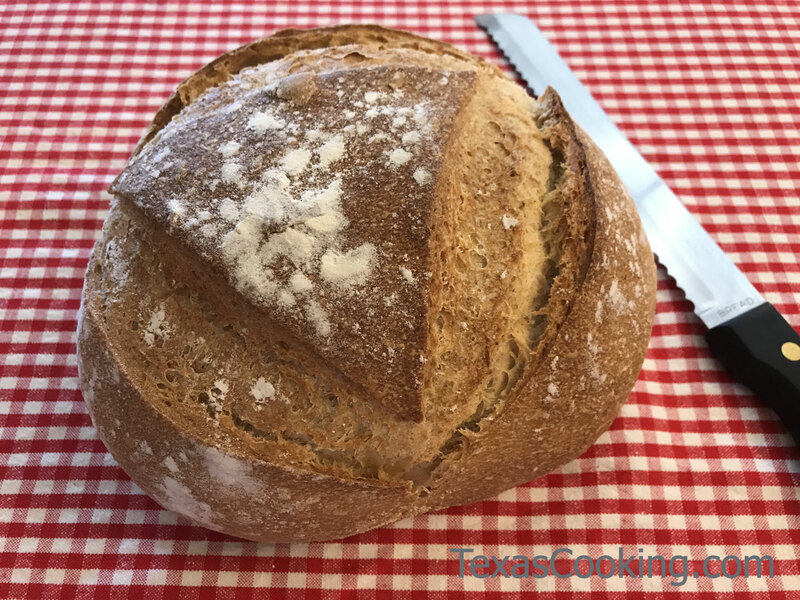 There are three basic types of bread: flat bread that stays flat and does not rise, baking powder bread or, "quick bread", that rises from the action of the baking powder, and lastly the yeast-risen breads. When we say bread "rises", we mean that bubbles are formed in the dough and the bubbles expand and make the dough (and the resulting bread) more tender. The bubbles are carbon dioxide, they are formed either by the chemical action of the baking powder or by the yeast spores active in the batter. Our subject this month is risen bread made with the natural yeast that lives everywhere in the world around us. The yeast spores float around in the air looking for a home. When they find a suitable place to live, they multiply and grow. To make sourdough products, we encourage the yeast spores to take up residence in a bowl of flour and water, one of their favorites habitats. Starter - This is your mix of flour and water with yeast spores living in it. Sponge - This is your starter mixed with more flour and water, used when making your dough. The starter is a living entity; it eats and grows. The yeast spores eat the flour and their waste products are carbon dioxide and alcohol. The dark liquid that will separate from your starter is called "hooch". That may be where the slang term for alcohol came from. A well-tended starter will continue to live and grow for a long time. There are many documented cases of a starter being kept alive well over one hundred years. As long as the starter is fed and not frozen or heated over 100 degrees, it will thrive. Okay, let's get on with the program. If your water has a lot of chlorine in it, use bottled spring water. Mix the flour and water into a batter resembling pancake batter. Put it in a plastic, glass or glazed crockery container with a wide mouth. Never put sourdough starter in a metal container or stir it with a metal tool. Set the sourdough container in a warm place, uncovered. In four or five days it should start to bubble up and smell sour. When it does this, you have successfully made your starter. There are starter recipes that call for anything from mashed potatoes to honey to commercial yeast, but this is the classic starter formula. The starter is a living thing, and it must be fed regularly. When your starter has reached the bubbly stage described above, add one cup of flour and one cup of warm water. Mix the flour and water well before you add it to prevent lumps. You can now put a loose fitting cover on your starter container. If you seal it tight, the expanding gases might explode the container or pop the top off, anyway. Your starter should bubble up and nearly double in size in an hour or so depending on the room temperature and the strength of your starter. Allow for expansion when you choose your container. About a quart size should be okay. When the starter has bubbled up and "grown", if you are not going to use it right away, you can store it in the icebox being careful not to let it freeze. After a week or so, you need to take the starter out of the icebox and feed it again. Let it come to room temperature and then mix in the cup of flour and cup of warm water. If there is hooch on your starter, just stir it in. It's part of the process. The night before baking day, take your starter and pour it in a large bowl. Wash the starter container and set it aside to dry. In another bowl, mix two cups of flour and two cups of warm water. When this is well mixed, add it to the starter in the big bowl. Again, mix the flour and water well before adding it to the starter. If you try mixing it directly into the starter you will have a lumpy mess. Cover the bowl with a towel or something to keep the dog hair out of it. The surrounding temperature should be about 75 degrees. Overnight it will have doubled in size and is ready to use. Measure out the amount of sponge called for in the recipe and return the rest to the clean storage container, feed it and then you can return it to the icebox. If you are going to do a large volume of baking, you will need to plan ahead to have enough starter for the job. The quart size will make two loaves of bread or a batch of biscuits. Next month we will start baking. We will include John's famous sourdough biscuit recipe plus some tips from the master himself. So run down to the store and lay in a big sack of flour and make sure you have some fresh butter for the bread and biscuits.